Emma and Ian are one of those couples who you know are just made for each other. Before their wedding day, I had only met Emma, so I wasn’t sure exactly what they were like as a couple. Once I met Ian, I knew that they were the real deal. One of the things that really stood out was how relaxed their wedding day was. Everyone was enjoying themselves, yet everything was still running smoothly and on time. Another thing that really stood out was how much thought and effort they put into some of the details. Probably my favorite wedding detail that I’ve seen in a long time is that each of Emma’s bridesmaids had a bouquet of only one type of flowers, while hers was a mix of all of the types of flowers. She said this represented each of them as an individual, while recognizing that she was a combination of all of their friendships. 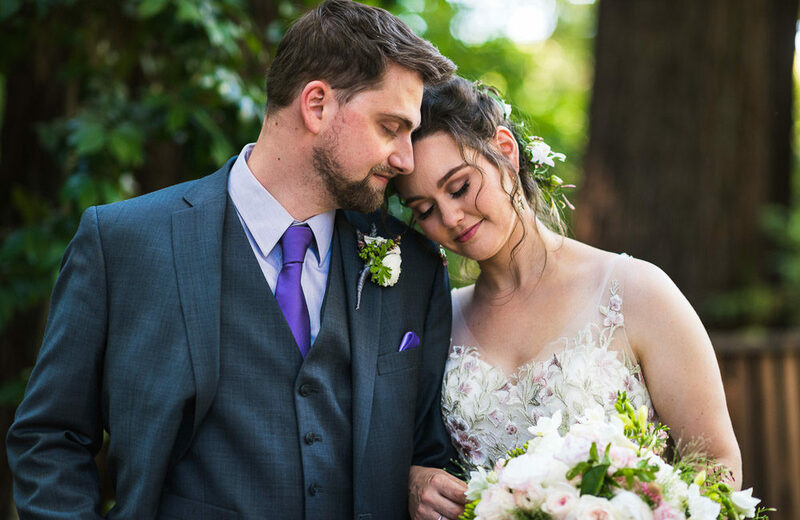 Their wedding took place amongst the redwoods at the beautiful Deer Park Villa. Friends and family enjoyed the warm weather during the day and got cozy by the fire pits once the evening cooled down. Through it all, Emma and Ian smiled, laughed and soaked it all in. While I wouldn’t want every single one of my weddings to be exactly the same, if they all felt a little more like this one I wouldn’t complain a bit. Coordinator: City Lights Event Co.